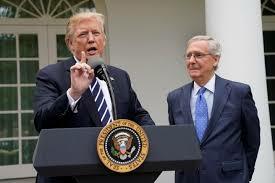 A couple of hours before Trump was claiming McConnell as his bestest friend evah yesterday, he was blaming McConnell for all the dysfunction in the Trump administration at a cabinet meeting. In the Rose Garden, with McConnell shrinking beside him: McConnell's a "friend of mine for a long time," said Trump, and we're "closer than ever before." At the Cabinet meeting earlier in the day: Trump said he was frustrated that Republicans had not accomplished more of his agenda but added that he's "not going to blame myself, to be honest." Good God. Has ever a threat of lethal backstabbing been more publicly delivered? Okay, I'm really delighted that Bannon read Julius Caesar in high school. I'm delighted that anybody in the Trump administration reads anything beyond their Q-Rating. But if I were Mitch McConnell, who scarcely a day after that Bannon attack was standing in dagger distance of Trump, I would not be locked in any embrace with the man who always turns on his friends when he needs to blame someone for his own failings. True, McConnell has so richly earned all this grief from the leader of his own party, who understands nothing about legislating and cares even less. McConnell punished Obama for eight years by obstructing everything, and now he must endure the idiot in the Oval Office who's pulling down the temple on all their heads. As you should know by now, I'm a connoisseur of political irony, and at this moment I find the circle closing like a snap purse. Consider the ads McConnell ran in 1984 to defeat Democratic Senator Dee Huddleston and thus began his rise to this present moment. You indeed can't run from your record, Mitch.